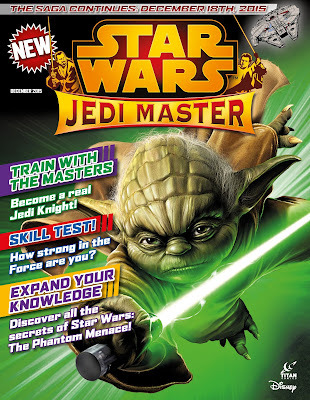 The saga continues with the all-new Star Wars Jedi Master Magazine! Titan Magazines is pleased to announce the launch of the all-new Star Wars Jedi Master Magazine, a 52 page, full-color magazine! Revisit where the whole saga began with Star Wars Jedi Master Magazine #1, on sale November 17 at all major retailers for only $4.99! Each issue is packed with fascinating features, fact files, character biographies and Jedi training puzzles. Every issue prepares Padawans for the journey ahead by teaching them about the exciting planets, battles, species, and important warriors pivotal in Jedi history in the run-up to the release of Star Wars: The Force Awakens! Plus, young Padawans get the chance to expand their knowledge, with trivia and secrets from Star Wars: The Phantom Menace! PACKED WITH JEDI TRAINING PUZZLES! PERFECT COMPANION IN THE RUN-UP TO THE RELEASE OF STAR WARS: THE FORCE AWAKENS!